Dan Barlow - Continued laser cutter upgrades and maintenance. juri aka. Julia Longtin - Two ~40mm aluminum extrusions, two more on the way. These are extraordinarily rigid, and expensive. We should build a large-area high-precision CNC machine on the optical table with these ASAP. Katie - Continued treasury support, and organizing the Lightning Talks. nootroope aka. Alberto - Hosting a class at HacDC for CAD modeling and 3D printing, two highly important skills. Awesome! Byzantium grant is over, mostly. Submitted final report. Response yesterday: website down, re-org going on, they say it'll be back. Trying to get some corporate sponsorship from work. From Doc, desktop going to crash cart. From juri, 1U nice server being put to use. Here is the financial summary spreadsheet for October 2013: File:HacDC Financials 2013 10.pdf. We gained Blake, Justin, and Zach, who were all voted in last month. We lost The Doc to San Francisco, Jason Fox to Argentina, and R. Mark Adams, PhD, to Cambridge. Here is the Project Awesome spreadsheet for October: File:HacDC PA Projects-2013 10.pdf. I'm able to declare a $1000 dividend and add $284.54 to our un-earmarked reserves. There were 17 votes, unchanged from the previous month. A big thank you to Alberto for answering lots of incoming queries from info@hacdc.org! ..and teaching and repping us! Dan: Larger objects can now be placed under the laser. 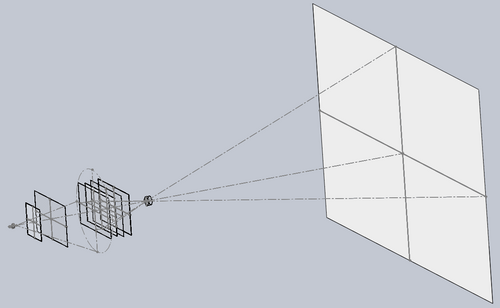 Added 5" lens, looking at adding another focal length, already has money. Wants feedback for longer term project.. How about a 100w source in addition to the current source? Do people want to cut through materials that the current source isn't adequate for? Porting Byz over to Wifi Pineapple mk5. It has 2 transceivers and its hardware is largely linux friendly with fairly beefy hardware for a router. Found some bugs, addressing them. Some ideas that got pushed back during the grant are starting to receive attention. Expect a new build not too far into the new year. I've been busy with other activities at HacDC, but would like to help organize a kit build early next year. Presently going over options and seeing whether I can plan to build upon the kitbuild's kit with a follow-on workshop that uses it to teach some aspect of electronics or programming. One option is a kit that might use an AVR. The Late Elliot Williams® has an AVR programming book from O'Reilly due out in December. I expect a copy soon and will go over it with these goals in mind! At >$1.4k, we have a sufficient reserve to make major repairs (~$300) to 3D printer, CNC mill, and laser cutter simultaneously. Recommend members who voted for SUPPLIES to change at least 80% of that vote to EXPANSION. Spare Prusa Mendel hot-end ($87.00). Laser cutter upgrade materials ($18.19). Small plastic containers. Useful as storage for small parts, solder paste tools, or laser cutter stock ($13.72). Ordered waterjet laser cut custom glass bed. Unfortunately, it cracked on installation, so I have eaten the >$68 cost :'(. Continuing attempts to laser cut, or manually cut, a new sheet of glass. Alternatively, an overlay may be used, see the red plastic mounted over glass on the printer. For anyone interested, One Day Glass does offer excellent service. More white PLA plastic will be ordered soon. After cleanup at HacDC, can consider improving generic supplies like mill stock, electronic components, laser cutter stock, and hardware (ie. screws). Newly proposed, general description on the PA_EXPANSION wiki page. We might want to fund new purchases (eg. metal working tools) or projects (eg. better laser cutter) to expand HacDC capabilites. Personally, I would like us to obtain a minimum footprint and expense toolset to develop almost anything in the manufacturing, electronics, optics, particle physics, semiconductor fabrication, biohacking, and software categories. Would like to see this operate democratically, with proposed purchases/projects and votes on the Project Tracker. Alternatively, feedback on the wiki page, or any feedback would be appreciate. Light discussion on how EXPANSION is different than SUPPLIES. No lingering questions. Some preference will be given to equipment which is already available as commercial-off-the-shelf (COTS), already constructed, or constructed from available materials (eg. Mouser parts, 3D printed brackets, etc). Longer term projects may be funded less readily. This is a fairly general purpose fund. Members voting for it are strongly encouraged to participate by watching the Project Tracker. Members may propose their own projects, however, anything funded under these HacDC funds must benefit HacDC's mission, and is is HacDC property unless officially voted otherwise at a member meeting. 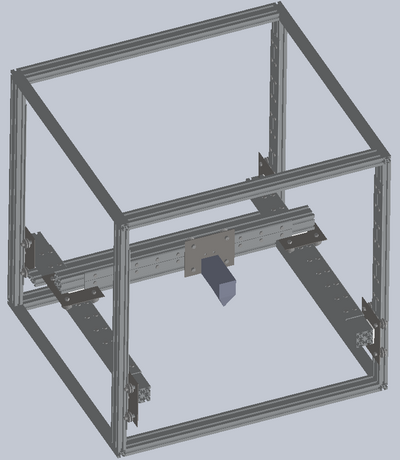 There are a few projects of my own I would like to eventually fund and build through this project for HacDC, such as an advanced linear power supply (~$50) and electron beam microscope (design in progress). Some tools on this list are necessarily expensive, I do not intend to absorb all failed expenditures. Wants to suspend until network infrastructure issues are addressed. Doing background research and at the point now where ready to present to others. Here's a summary (written for international development projects, but still applicable). Sec's note: group says this isn't an official PA yet. Notice needs to be sent to member's list describing it. Christine says she understands. HARC Technician License prep class 11/13 and FCC License exam session 11/23. David and I are wrapping up installation of a donated asterisk server and VOIP phones at St. Stephen's. On 13 and 14 November, Andy Ta and I will be staffing a table at Smithsonian's inaugural SI X 3D conference on behalf of HacDC. They have us sitting between Autodesk's and 3D Systems' tables. <_< We'll be featuring Andy Ta's OpenDLP stereolithographic printer. Thanks to Andy for letting us ride his coat tails to glory! Project EXPANSION (above), the low temperatures, and the Basement Shelves are the important items. It's getting colder. Low temperatures are generally less problematic than high temperatures, but some of our equipment (ie. laser tube) will self-destruct as 0C is approached. If safe, perhaps we should invest in a window unit with heating capability in the back room. Leaving the laser tube pump running indefinitely has also been suggested. Hax: talked with Brian, small heating pad seems to be the solution. False indications (bounce) occurred Sunday night, however, normal functionality returned in the morning. Probably due to low temperatures slowing down the MCU oscillator. A more reliable system has been published at github. Nevertheless, the low temperatures observed are cause for concern. As reported last month, participating members will retain rights to their own technology. Important lessons have been learned negotiating the NDA that probably should be applied to similar arrangements in the future. A few hundred dollars, probably soon. Royalty payments, probably much more significant. More progress. Will give more information with permission. Has eaten far more of my time than expected lately. USB 24bit ADC merged with host board and built. Medically isolated RECOM power supplies integrated. Batteries and soundcards eliminated, proper casing and software support in progress. Two giant Fresnel lenses have been delivered to HacDC's basement. We still need three more giant Fresnel lenses from rear projection TVs. Project is stalled until we get these lenses. Alternatively, it may be possible to optically combine smaller displays, an approach which could offer even greater light output and resolution. However, this would require a video combiner, and alignment would be technically challenging. David W: can gain access for someone to the recycling center and pick parts.. Dan chimed in as willing to help. Just a reminder, the design is published, with CAD models, as OpenDisplay. Advanced multi-tool desktop factory based on OpenRail. Intended to simultaneously operate multiple milling, laser, extrusion (FDM 3D Printing), and inkjet (powder 3D printing, 2D coloring) tools. Simulations indicate deflection should be 8mm/metricTon of lateral force. Still in progress. 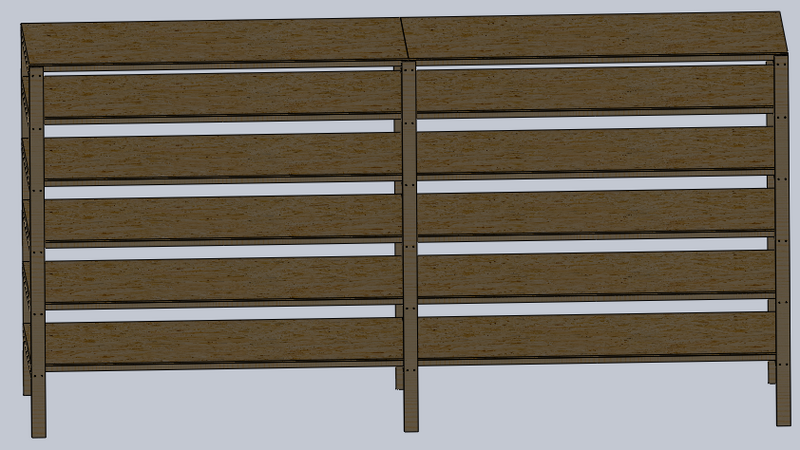 Nearly complete design, just needs actuators (ie. threaded rod, timing belts). Ahmed Aden bought us a myDAQ and myDSP for us almost a year ago. These devices can add core testing and signal processing capability to our test cart. Eric Miller has been holding them since. Reportedly, he has not been using them, but is unwilling to make a "special trip" to deliver them back to us. It is also possible that he has lost track of, or otherwise did not verify, the software requirements. They were NOT purchased with Eric Miller's own money for his own use. Ahmed Aden has volunteered to ask him to return these tools, and we agree the request needs to be polite. That said, I am deeply disappointed in Eric Miller's conduct. A variety of approaches have been tried to fabricate professional quality circuit boards on the laser cutter. All have failed, and the CNC mill remains superior. Our CO2 laser is just not suitable for this kind of work. Please see HacDC Projects, and add anything that might benefit HacDC. Recommend we allocate $600 for two of these shelving units, one in each room. Also recommend someone besides myself build them (eg. haxwithaxe), which shouldn't take more than a day. Designed for HacDC Basement. Intended for placement a few feet away from wall in both rooms as necessary, accessible from both sides, providing a sort of warehouse. 8' high, 16' long, 4' deep, 16" elevations, density-optimized reinforcement. $264.99 for 384 sq.ft. at $1.44/sq.ft. For comparison, I estimated the shelves on the back wall of the workroom to offer only about 50 sq. ft. There will still be plenty of room in the basement for the optical table and power tools, particularly if we do not immediately implement the second unit. In fact, this will definitely increase the available space both upstairs and in the basement as items are taken off the floor. 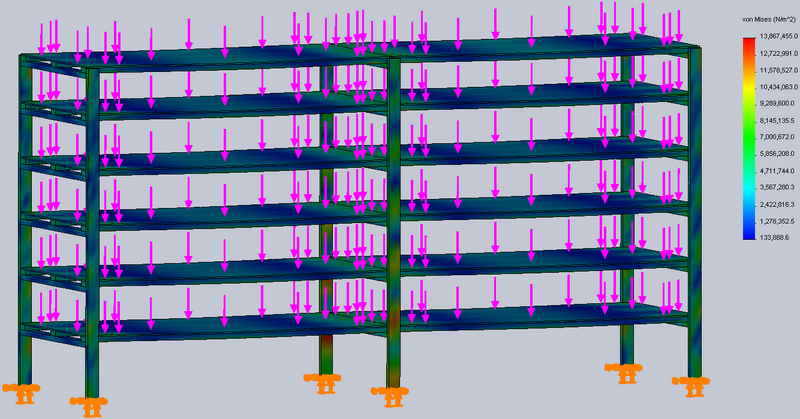 Please see github for CAD model, BOM, and simulation results. At least two organizations are interested in corporate membership. Perhaps we should put together a policy on this, focused on keeping financial gains high enough to justify any risks. A supplementary remote or RFID entry system might also be helpful. F3 robot arm went to UMD at Robotics center, being used by student for project. $600 for shelves to mirage. Quorum not met, could not vote. The Doctor is one of the founding members of Project Byzantium and one of the largest contributors to the project. He has made numerous other contributions including donating time and equipment to improve the space, and helping us to network with other individuals and organizations with shared interests. Former President of HacDC. He is also headed off the SF. Brad has been a long-time supporter of HacDC's mission. He donated a lot of time to HacDC over the years including teaching a number of classes on a variety of topics from Python to lockpicking to yo-yos. Long time member and contributor to the space. This page was last modified on 22 September 2015, at 09:42.